I stumbled across mine at a flea market and had to get it. You better have some good knees, cause it is a shallow clad killer for sure. Set the discrimination to just below zinc and cherry pick shallow clad coins til your heart is content. As for gold and jewelry, so far I have only found one silver ring. But that one was next to a chain link fence and I had missed it with my other machines. If you choose to dig it all, set the discrim' low and be prepared for a lot of trash. I plan to keep mine, as it makes a good backup and an easy machine for my friends to use. "Metal Detectors are not inexpensive and the cheaper ones don't work very well" I've heard that quite a bit and this little Tesoro flies in the face of such comments. It will hunt as well as anything out there with a fantastic response time to a target. I have more expensive machines but the Compadre is the one I toss in the truck for a quick hunt. It's certainly one that is ready to go for any new spots one gets a chance to hunt. This unit is one that belongs in every hunters collection. No detector is simpler to use. Got one in a package deal and was excited to toy around with it after watching so many of TexasTigerDigs youtube vids with him praising the compadre for what it is. I tell you what, I had quite a bit of fun with it on the playground. I own a whole slew of other detectors and was skeptical about this unit. While I would still prefer my xp deus to this unit for any grass or field, this is still a fun tot lot hunter. And for the price, my above preference isn't even in the same genre or price range. Bottom line, this thing will hunt out a lot and hit hard on targets. The 'lack of depth' that some say will work to your advantage on playgrounds where you shouldn't be digging below the liners anyway. With that said though, I was impressed when the last coin I snagged on my playground hunt was a copper penny at 7", down into the clay layer beyond the mulch bed. For the price, IMHO this unit can't be beat. The warranty can't be touched by any other manufacturer. I will certainly keep this in my truck box to hit the occasional playground that I pass for an impromptu hunt. My unit has the 5.75 coil. I grew up in the lunch box era of metal detecting. I've used many different machines over the years and dug up thousands of coins. I've owned a whites goldmaster, jetco treasure hawk which was a BFO type detector, a fisher M scope that was a tube type detector which worked great, a bounty hunter and a tesoro silver sabre. I currently own a fisher 1280 x and a minelab sovereign XS. I purchased a Tesoro Compadre for my kids to use because of its simplicity. I gave it a shot on an old spot I've hunted over and over again and boy was I impressed. With the stock small coil it comes with I was able to get into the bushes and tight spots with ease and it produced many good finds. I cant say anything negative about this detector. I've pulled out large cents at 8 to 10 inch depth. It hits large iron targets like horse shoes...Deep. I'm not a detectorist that cares much for a meter or LCD display or multi tones. Arm your detector with a quality set of headphones and listen to your machine with out multi tone distractions or a bouncing LCD screen. The compadre reminds me of the simplicity of my old tube type fisher M scope which had one tuning knob and to turn the machine on you just plug in the headset and you are ready to hunt. The Compadre isnt a toy by no means! It's a turn on and go dig machine with great discrimination. When you hit a repeatable target with the Compadre its a good target whether it be a coin, ring, or a piece of brass or copper. The compadre has paid for itself 3 times over plus just in clad change. This detector excels in trashy areas, it will chatter and blip through the junk but when you get that solid repeating signal your digging up something good. THANKS TESORO for producing such an outstanding machine. I'm a veteran detectorist and I hope this review helps anyone looking for a great detector to buy that is user friendly and puts goodies in your pockets. I've owned a lot of different machines at various price ranges. Overall, the Compadre is still my favorite because it has been the most dependable and has found the majority of my best finds. I've owned all three versions/coil sizes. I prefer the older 7" coil model. Good headphones are a must on the Compadre if you are serious about learning the machine's tonal responses. I like having the ability to thumb the discrimination and then be able to have a good idea of what is below the coil. Large metal objects can be eliminated simply by lifting the coil up about 6" and if the target response is still strong, it is most likely not a good target. I found 44 rings this past year and a lot of small jewelry items. Most were junk rings but many were not. I can't say that about any other machine I've owned so far. I find as many nickels as a do dimes, quarters, and pennies, and pulltabs. Most of my finds are in the 3" to 7" range. However, my deepest coin find so far has been a large cent in the 8" range. I've owned this machine for 5 years and filled jars with coins and relics. I've gone over the same areas I hunted with other machines and this lil guy works great. Adjust the disc to take out the zinc pennies and cherry pick the site first... Then run it til it just accepts nickles and it will hit the rings and small gold jewelry. I cant say anything bad about this machine. It's great for taking to the park where you don't want to dig gopher holes. I have other machines I use when hunting relics around old homesteads and in the woods where I take a shovel to dig. The small coil is great for target separation and getting all the coins out of a spill spot. Cute, and simple but a backbreaker! Got the Compadre with the 5.75 coil for hunting trashy areas. Read a lot of reviews on it and thought I'd open my mind and give it a try. Been MD'ing for 30+ years and let me tell you, using a Compadre vs even the lowest end of the TID type machine spectrum is like using an old Commodore 64 vs a hot new Macbook Pro. The Compadre is an oddity. A $160 machine built for turn-on-and-go detecting. It'll find very shallow clad at best, so if that's what you're looking for, by all means I recommend this little machine. Don't expect it to hang with the big boys like most of the reviews suggest. It just won't. It's not made to. Personally if I was just getting into detecting, I'd avoid the Compadre (unless you want an entry level gold prospecting machine then get one with the 8" coil) You'll dig a LOT of trash else cranking up the discrim will cause you to lose depth (not to mention nickel and gold) and there's no room to lose depth with such poor depth to begin with. Love the lightweight, single 9v drop in battery and lifetime warranty. This little machine SCREAMS for a sensitivity control. I'd rather pay an extra $15-$20 to have a sens control then cut corners on a cheap machine. There's still some headroom in that $160 price point for an adjustable sensitivity control. 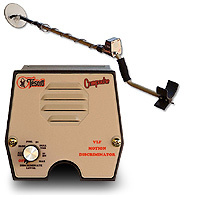 Spend a little more and get a Teknetics Delta 4000, Fisher F2, White's Coinmaster or Coinmaster Pro. You and your wrist, back and knees will thank me in the long run. J ai acheter le compadre, pour faire les endroits pollués c est un merveilleux detecteur,qui va pour toute la famille avec lui vous êtes sure de trouver des monnaies,et bijou a condition de ne pas monter la discri, a plus de l élimination des petits ferreux,je le recommande absolument. A avoir dans le coffre de sa voiture. J I bought compadre for places polluted, it is a wonderful detector that goes for the whole family with him you are sure to find coins, jewelry and a condition not fit the discrimination, has more than the elimination of small ferrous, I absolutely recommend it. To have in the trunk of his car.